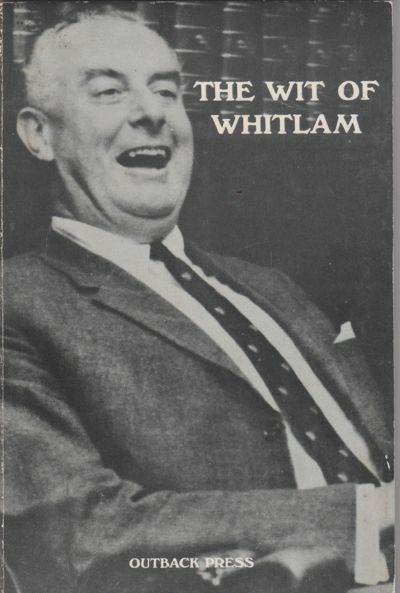 96 pages of wit of Gough Whitlam. From 1952 to 1975. A very rare book that is very hard to find. The Opposition would not have been able to follow this course if the Senate elected in 1974 had remained intact. Although one of the two independents joined the Liberal Party, the other, Steele Hall, was opposed to blocking supply, and this would have been sufficient to prevent such a course being followed. The change in the composition of the Senate which made the constitutional crisis of 1975 possible was brought about by two appointments to fill vacancies in the Senate, which under the Australian Constitution are made by the State Parliaments. Since the introduction of proportional representation for Senate elections in 1949, there had been a convention that Senators who died or resigned should be replaced by a Senator of their own party, and all state governments had adhered to this convention. In February 1975 the Premier of New South Wales, Tom Lewis, broke the convention by appointing an independent Senator, Cleaver Bunton, to replace the Attorney-General, Senator Lionel Murphy, who had been appointed to the High Court of Australia. This appointment made no difference to the political situation, because it turned out that Bunton was opposed to blocking supply, but it provided a precedent for the Queensland National Party Premier, Joh Bjelke-Petersen, when a Queensland ALP Senator, Bert Milliner, died on 30 June. Bjelke-Petersen refused to appoint the ALP's chosen replacement, Dr Mal Colston, and asked Labor for three alternative nominations. Bjelke-Petersen said he had concerns over Colston's integrity, but Labor maintained that his real intention was to appoint a Senator who would support the blocking of supply and thus help bring down the Whitlam government. When Labor insisted on nominating Colston, Bjelke-Petersen nominated Albert Field, president of the Federated Furnishing Trades Union and an ALP member of thirty-eight years standing. Bjelke-Petersen maintained that he was therefore not breaking the convention. Under ALP rules, however, Field ceased to be an ALP member as soon as he accepted nomination against an endorsed Labor candidate. Field said that he was opposed to Whitlam's behaviour in office and that he had approached Bjelke-Petersen asking to be nominated to the vacancy. Labor maintained that in these circumstances Field was in effect an anti-Labor Senator and that Bjelke-Petersen had broken the convention. Field was granted leave from the Senate when High Court cases were filed challenging his eligibility to sit. But the change to the composition of the Senate was in any case decisive, because with Milliner's vote gone, the Opposition could pass Senate motions 30 votes to 29. Rather than blocking supply, they moved to delay consideration of the budget. Whitlam was determined to face the Opposition down, and proposed to borrow money from the banks to keep the government running. He was confident that some of the more moderate Liberal Senators would back down when the situation worsened as appropriations ran out during November and December. Fraser also knew that the Senators were wavering, and he urged the Governor-General Sir John Kerr, to act. Kerr had been a Whitlam appointment, but he had developed a grudge against the Prime Minister, who he felt had ignored him and snubbed his wife. Kerr was also concerned about the legality of Whitlam's proposals for borrowing money, as were the banks. Kerr contacted the Chief Justice of the High Court of Australia, the former Liberal Attorney-General Sir Garfield Barwick, who gave Kerr private advice that it was his duty to dismiss Whitlam. Kerr was also advised, by New South Wales Governor Sir Roden Cutler that he must warn Whitlam of the possibility of his dismissal. So on 11 November 1975, without giving Whitlam more than a moment's warning, Kerr revoked Whitlam's commission and installed Fraser as caretaker Prime Minister until a federal election could be held. He then immediately accepted Fraser's advice to call a double dissolution election, in an ironic twist using as triggers the same bills that the Coalition had rejected in the Senate. On hearing the proclamation dissolving Parliament, which ended with the traditional 'God Save the Queen', Whitlam delivered his famous impromptu address to the crowd that had gathered in front of the steps of Parliament House. During the speech he famously labelled Fraser as "Kerr's cur" and told the crowd: "Ladies and gentlemen, well may we say 'God Save the Queen', because nothing will save the Governor-General." 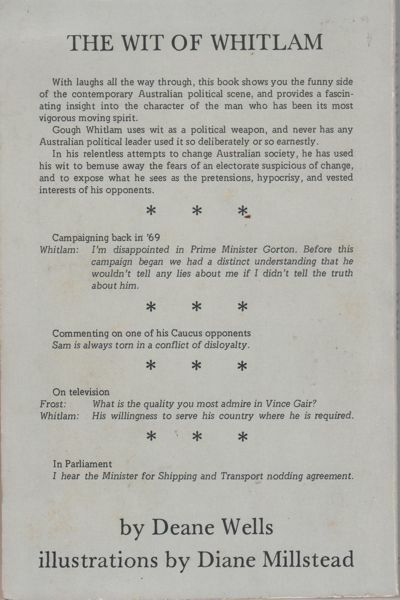 Although there were a number of public protests against Fraser during the campaign, the media (especially the Murdoch press, which had supported the ALP in 1972) had long since lost confidence in Whitlam, reporting a string of ministerial failures. This had a major influence on public opinion, signalled some months previously in the Bass by-election and the election resulted in a landslide win to the Coalition.